Obesity is usually defined as 15% to 20% above ideal body weight. Less than 15% over ideal body weight is considered "over-weight". Obesity is a condition in which excess body fat accumulates to the extent that it may have a negative effect on health, leading to reduced life expectancy and/or increased health problems. Excessive weight results when more calories (energy) are consumed than can be used. Thyroid function or other medical issue are less common causes of obesity. decrease tolerance to heat stress. A 2013 study conducted by the Association for Pet Obesity Prevention (APOP) reports that over 57 percent of pet cats are obese or overweight. Before embarking on any weight loss plan, a check-up and examination of the cat by its veterinarian is highly recommended. As part of the examination, a veterinarian will determine the cat's weight, how much overweight the cat actually is, and run blood /urine tests. The veterinarian will determine that normal thyroid hormone levels and no physical or metabolic disorder is present in the cat. If there is no medical reason causing the cat being overweight, then a slow decrease in food intake is usually recommended. Feline obesity is often the result from Free Feeding or Overfeeding. "Free Feeding" or "Free Choice" means the food is always available to the cat and it can eat as much or as little as it chooses. Some cats simply cannot be free fed and some owners have difficulty judging the appropriate amount of food their cat needs to maintain a healthy weight. Feed a cat two to four meals each day. Use the guide on the back of the Cat food bag to find the recommended daily serving amount and divide the daily amount into two (to four) feedings depending on the cat's weight. For instance, if feeding Life's Abundance dry food and the adult cat weighs between 3-6 pounds, the suggested serving amount is ¼ to 1/3 cup per day. Divide the recommended amount into two to four feedings each day. An owner can adjust the amount of food based on their cat's weight and body condition (less food each day if the cat is obese; more food each day if the cat is too thin). Please note: Kittens require 25% more than the recommended daily serving amount than an adult cat. Many cat owners believe that treats are a necessity. Just like with human beings, we do not NEED treats or desserts. Instead, offer the cat a treat as a reward for good behavior (not for vocalizing as the cat will "learn" that vocalizing earns him more treats) and only offer treats that are nutritional and not empty calories. Empty calories are treats that contain mainly fillers, are high in fat, and have little to no nutritional value causing weight gain. If a cat gains weight because of treats, either stop or reduce the treats offered every day, and/or slightly reduce the amount of food given the cat to offset the treats. Only reduce the amount of food, if feeding a nutritionally balanced treat. Daily exercise for a cat through interactive toys is important for both physical and mental health. Playing with your cat also increases the bond between owner and cat. A second cat is often a good idea as cats will play with each other, thus increasing physical activity (exercise). A cat does not need a special "weight loss food" in order to lose weight. Simply reduce the daily amount of cat food. A cat's weight loss diet must be done gradually… no crash diets! Cats have a unique metabolic response to fasting and whenever a cat's food intake is rapidly and markedly decreased, a serious and potentially fatal disorder can happen, Hepatic Lipidosis. Hepatic Lipidosis, also known as "Feline Fatty Liver Syndrome", is one of the most common forms of liver disease in cats. Officially, the disease has no known cause, although obesity is known to increase the risk. The disease begins when the cat stops eating from loss of appetite, forcing the liver to convert body fat into usable energy. If this continues for too long, fat builds up in the cells of the liver, and thus the onset of the disease. Any feline weight loss program should take place over 4-6 months (or longer) depending on the amount of weight to lose. Every four weeks reweigh the cat. If there is no weight loss at all, or even some weight gain, the amount of food being fed is too much. For example: A 15-pound cat should not lose more than half a pound in four weeks. 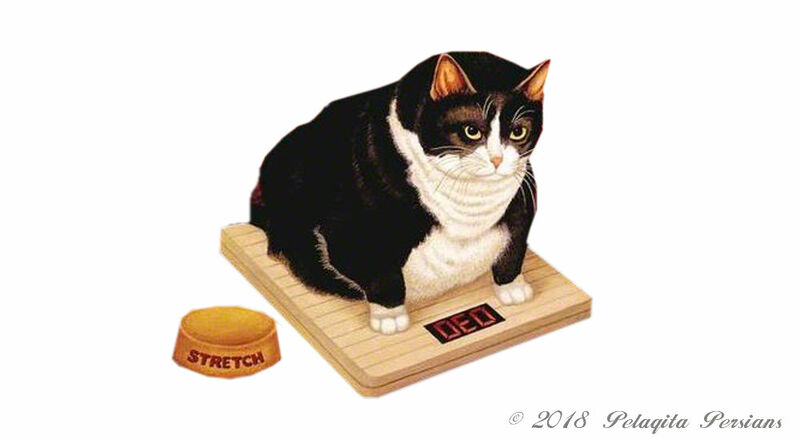 When the cat reaches its maintenance weight, it will not look either too "fat" or too "skinny". Besides weighing the cat, an owner can also place their hands on either side of your cat's body and "feel" its body weight. If your fingers can sink between each rib, the cat is too thin. If your fingers cannot feel any ribs at all, the cat is too heavy (overweight). An owner should be able to feel the cat's ribs without their fingers sinking between each rib. A cat will be more active and alert at its proper weight. Additionally, the cat will have successfully avoided the probability of diabetes, arthritis, and Hepatic Lipidosis due to obesity. Furthermore, a cat will probably live longer and have a much better quality of life!